My Lighted Burlap Garland that I made for Christmas several years ago always goes crazy this time of year. I assume it’s because all of the stores are already setting out Christmas stuff – HA! I figured I better make it a 4th of July companion project. 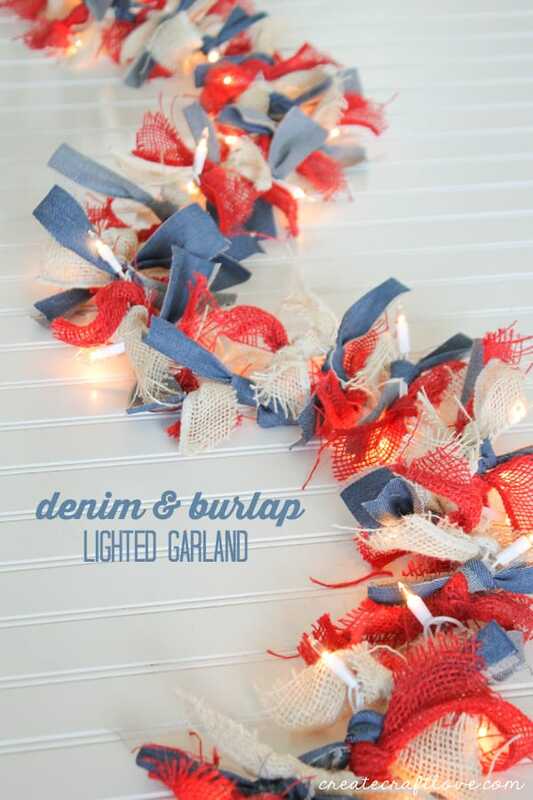 And since denim is all the rage this summer, I used it as the “blue” to create this Denim and Burlap Lighted Garland! If you read this blog at all, you know that I really love the whole farmhouse style and this fits in perfectly! 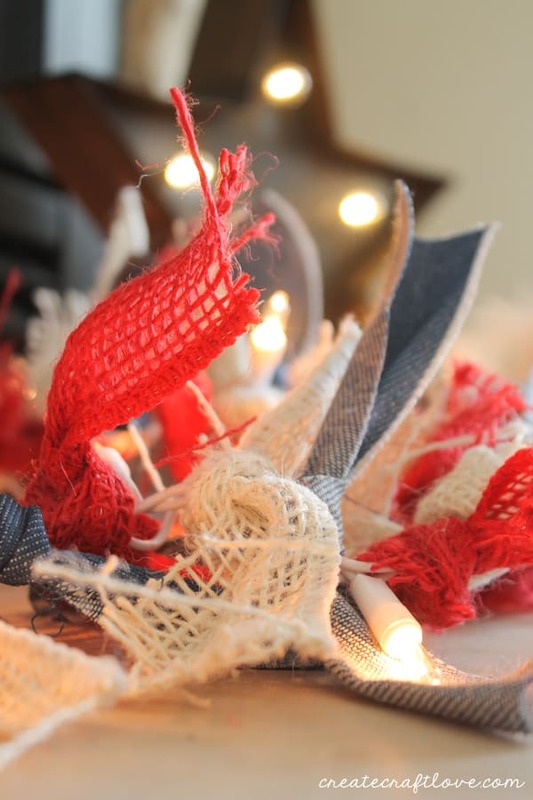 All you need is scissors, white mini lights, red and white burlap rolls and a denim roll. 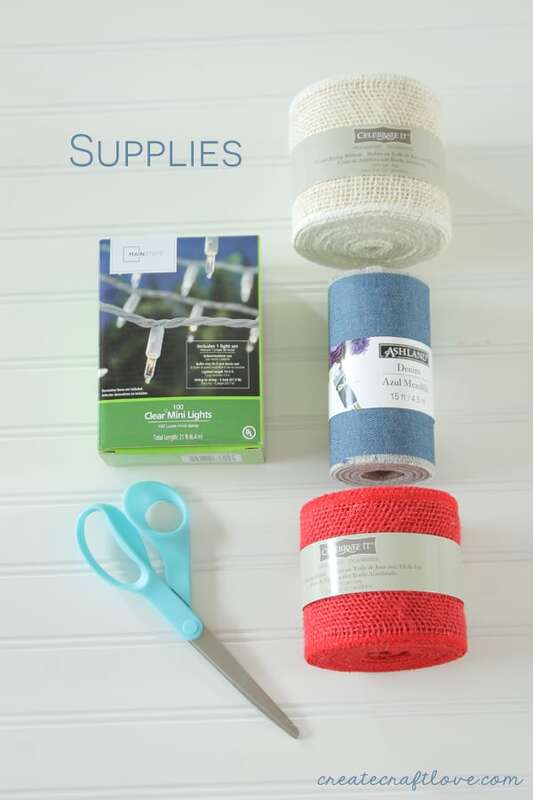 I found all of these supplies at Michaels – including the denim ribbon. This is a messy project. Little bits of burlap get all over your pants, the floor, the child. 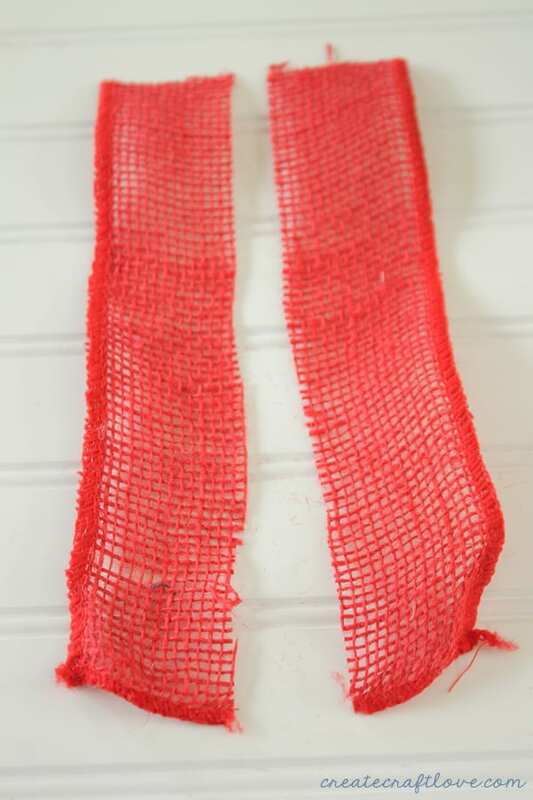 It really itches if you are wearing shorts, so I recommend long pants when tying all of these ribbon strips. Cut the red burlap ribbon in 10 inch sections and then cut length wise down the middle. Repeat this same cutting process with the white burlap ribbon. 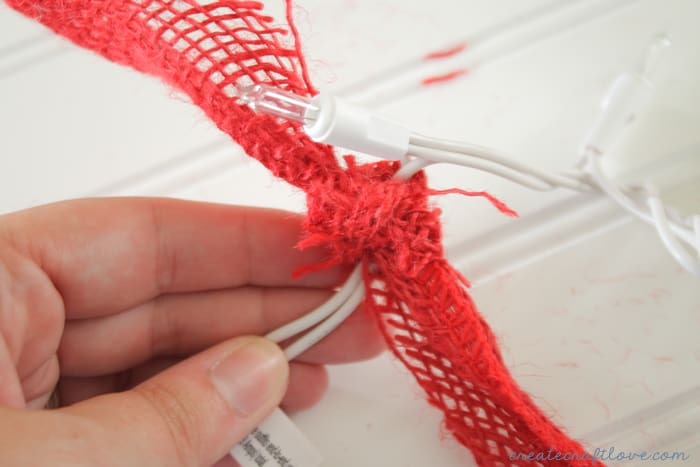 To cover the entire string of lights, you will need two rolls of each type ribbon. 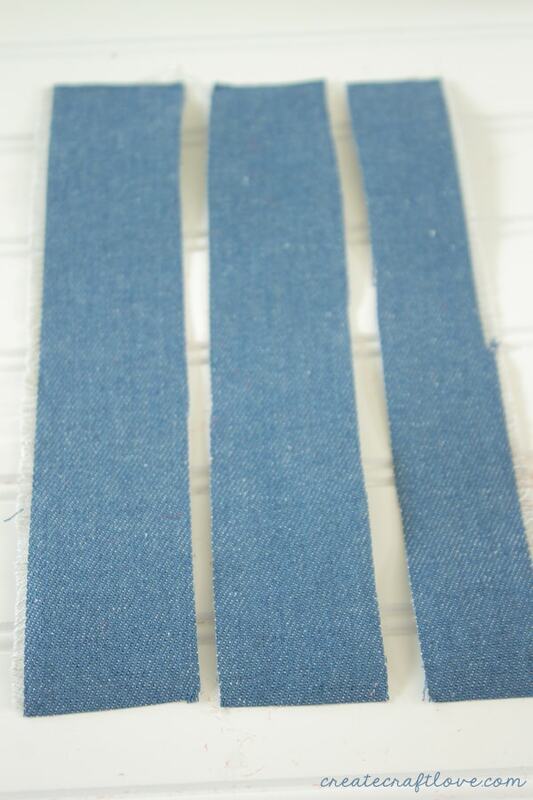 Cut the denim ribbon in 10 inch sections and then cut into thirds length wise. Don’t judge my cutting. Apparently, this is what thirds looks like to me…LOL You won’t be able to tell with the completed project. Decide what pattern you wish to use in relation to the colors. 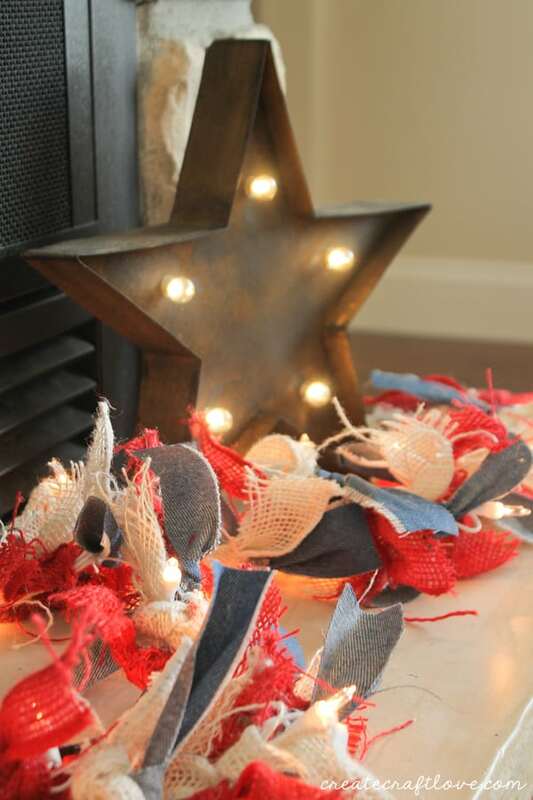 Simply tie the strips of burlap and denim around the mini lights. I only tie once. If you choose to double knot, you will need more ribbon as this will change the length requirements. I think it looks too bulky double-knotted, but that is just my style. 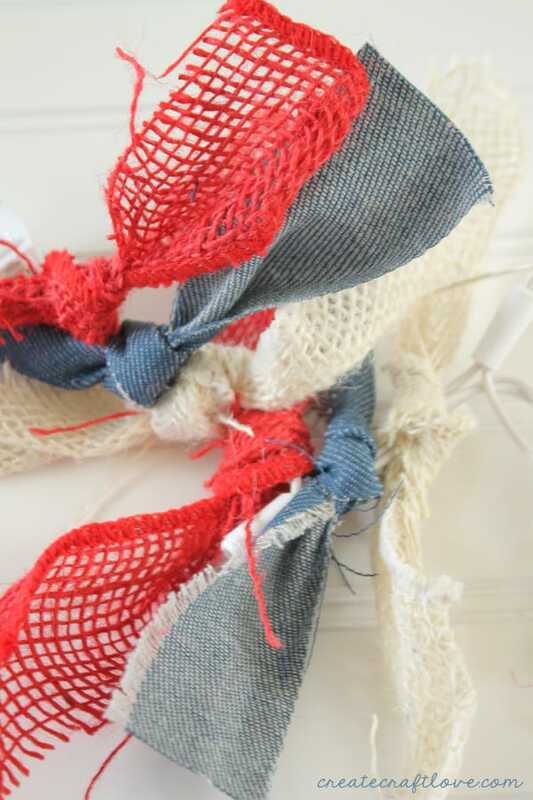 Continue tying the strips of burlap and denim ribbon around the wire until the wire is completely covered. I love the touch of Americana it adds for the Fourth of July! The denim and burlap are so in right now! Isn’t it homey? Once it’s complete, simply hang the lighted garland and turn on the lights! I can tell you from personal experience, the lights will not cause problems with the burlap or denim. I had my Christmas one lit for 30 days straight with no problems. True story. 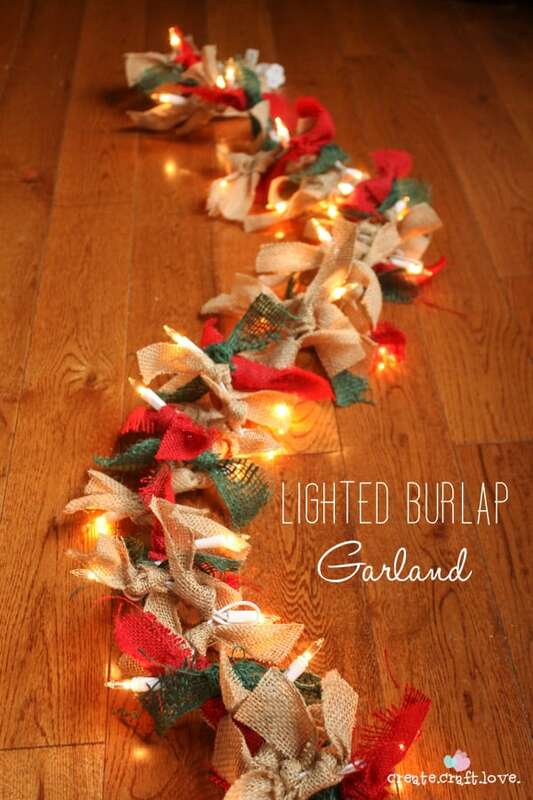 And in case you missed the original post, you can check out the Lighted Burlap Garland HERE!